Some railfan excursions work out really well and you see something new, or different, or get a great photograph. Some... well, on some excursions, you are just grinding. "Grinding", for those who aren't computer gamers, is doing repetitive actions in a game to gain points or experience to advance in the game. Sometimes it's called "farming". An example would be going out and killing some monsters in the game and collecting gold. It doesn't advance the plot but it gains your character some money or experience points. Sunday afternoon was a grinding expedition. I knew the photos weren't going to be spectacular from the start. It was a gray, overcast day with no prospect of any sun. I didn't expect any unusual power but I was hoping to catch one of CN's "new" rental units (see below). I decided to head to the CN Sprague subdivision. As I approached it, I saw a train coming into Winnipeg from the east. I barely got to Symington yard before the train. 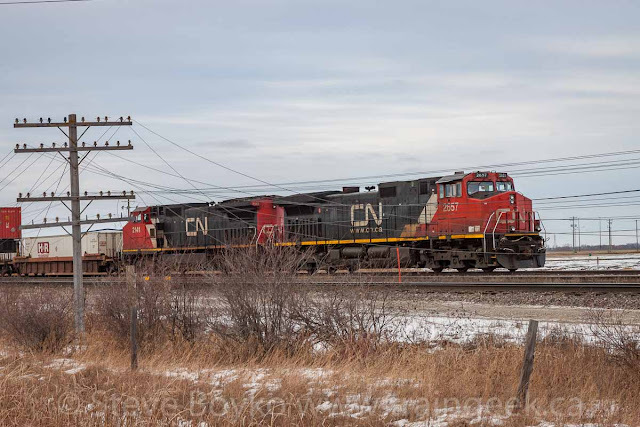 CN 2037 and BCOL 4647 were hauling a decent-sized train. They stopped briefly after they passed me, probably to line a switch, then carried on. 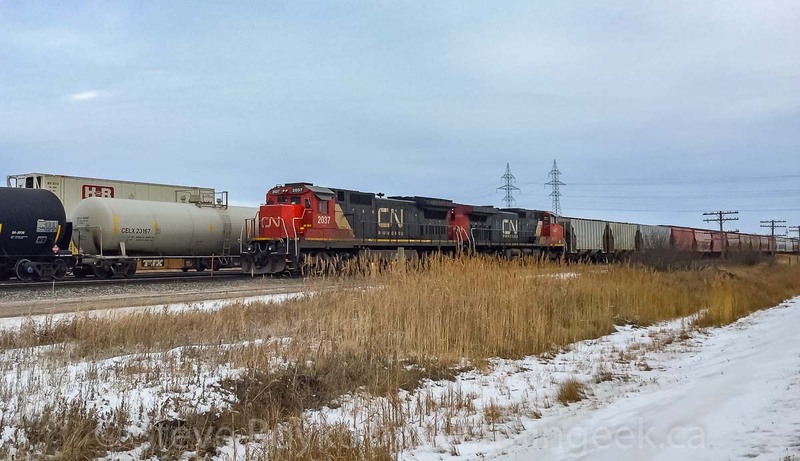 On the second track was a hump yard set with CN 6016, GTW 5948, CN 6010 and slug CN 203. These are permanent members of the hump fleet here in the 'peg. On the third track was an intermodal train led by CN 2657 and CN 2141. I wasn't sure if this train had just arrived or was about to depart. It turned out that it had just arrived and was probably pushing its containers back into the intermodal yard in Symington. It didn't look like anything was coming in on the Sprague, since that train had just arrived, so I decided to go east and check out the CN Redditt subdivision. That's Redditt with two "t"s, not the well-known Internet site with one "t". 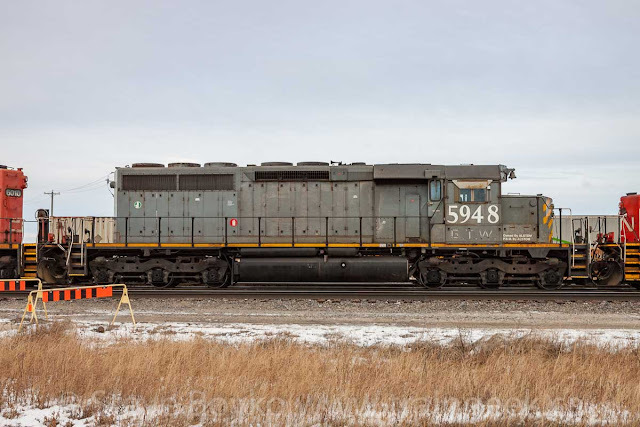 There was nothing going on in CN's Transcona yard - cars but no locomotives - so I headed out toward Dugald. 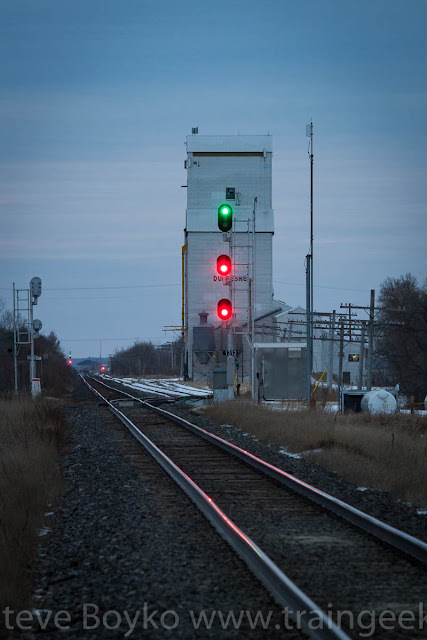 There was no indication of any action as I passed through town, and I went just east of Dugald and looked east down the arrow-straight track and saw nothing. Oh well. I returned to the CN Sprague subdivision. I saw there was a green signal facing Symington, indicating it was clear for an outbound train, but nothing was moving yet. I drove out to the Lorette siding and found a 4-unit train sitting there.. led by shiny CN 2991 then grimy CN 8865, CN 5773, and CN 8852. CN 2991 was shiny and new so I took a few photos of it. You can see how the sky was pretty dull... there was a little colour in it due to the (hidden) sunset but it wasn't really photogenic. The train had about 15 or 16 loaded coal cars... odd for Winnipeg. I continued down to Dufresne, wondering if another train was in the 6500' siding there. There was no train, but the new LED signals were well lit up. 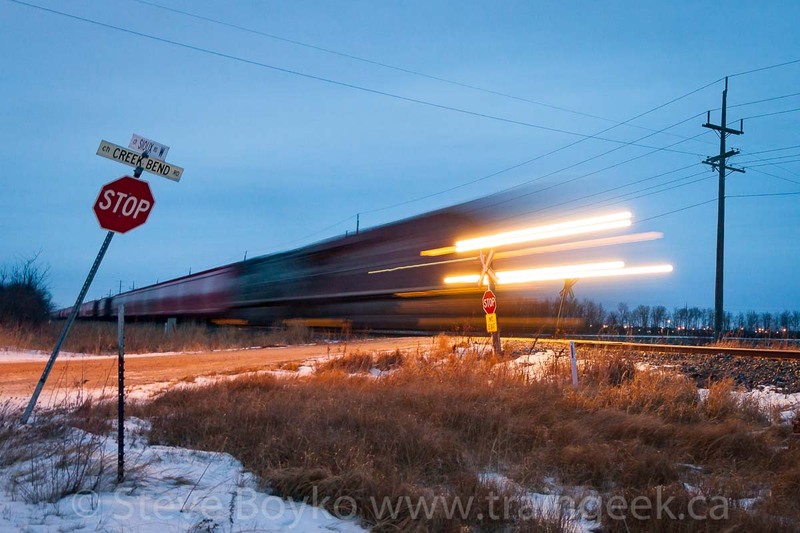 On my way back, I passed the train at Lorette again with no sign of the train it was supposed to meet. I finally did spot the train right at Deacon's Corner but I wasn't able to get over to photograph it. 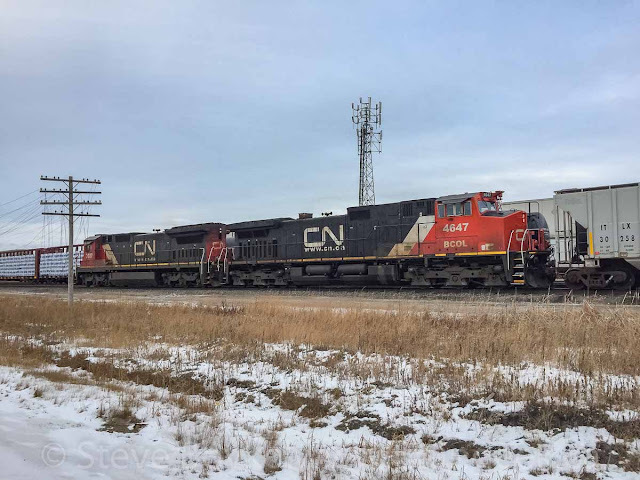 It had CN 2909 on the head end of the intermodal train, with another locomotive on the rear. By this time, it was almost 5 PM and it was time to hit the grocery store and get home to make supper. Also, it was getting pretty dark. As I crossed the CP Emerson subdivision on my way home, I saw a headlight to the north. I went to a quiet crossing just north of the Perimeter Highway and waited for the train to come. I decided to put my camera on the tripod and take a 1 second exposure and let it streak, rather than try a pan. I had my phone out to take video. It was a potash unit train with CP 8750 and CEFX 1059 leading the charge. I do like long exposure train photos! That was enough for me... off to Sobeys! There are rumours of more but that's what has been confirmed to date. The CREX units are apparently getting microwaves installed so they can lead on CN. 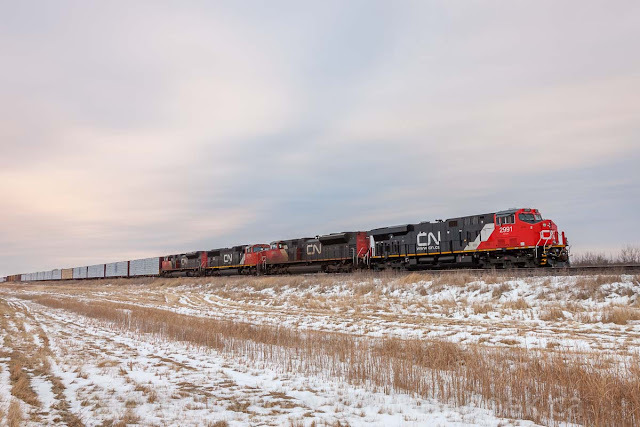 Union rules on CN require a microwave and refrigerator in the lead locomotive, so usually American locomotives have to trail on CN because they don't generally have both of those. CP's union doesn't insist on having a fridge or microwave so CP's trains often have "foreign" power leading. I'm sure I will catch a CREX unit soon... I just have to keep grinding!